Cover to Baird's field notebook in Dickinson College archives. 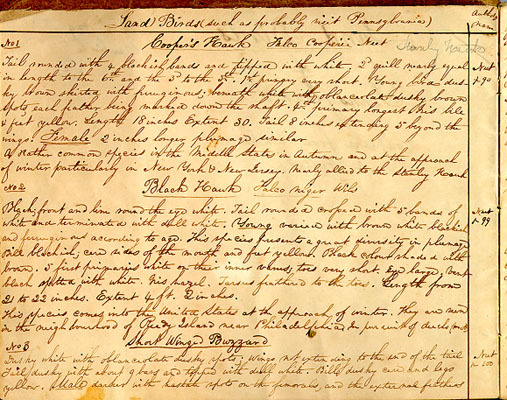 See image (lower left) for a page of the journal with its bird-watching entries. Spencer Fullerton Baird was born in Reading, Pennsylvania, in 1823. He attended West Nottingham Academy near Port Deposit, Maryland. He entered Dickinson College at the age of 13 and received a bachelor’s degree in 1840 and a master’s degree in 1843. By 1842, he had collected 650 bird skins representing 128 different species. 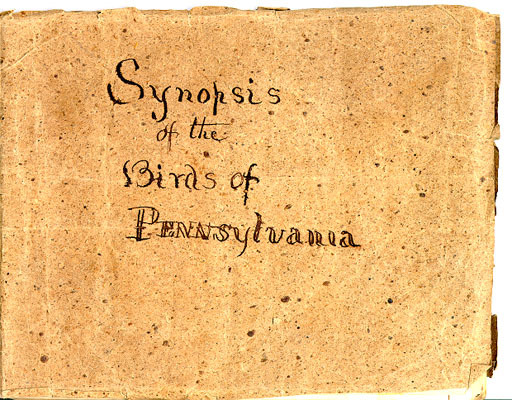 While still a student at Dickinson, he began corresponding with John James Audubon and other leading ornithologists and naturalists of the day. In the fall of 1846, he was appointed Professor of Natural History and Curator of the Museum (the extensive natural history collection) at Dickinson. Scientists such as Baird believed it was imperative to study that natural distribution of flora and fauna before it disappeared. The distribution of such life forms would be studied to uncover the great laws governing life, especially to evaluate Charles Darwin’s recently published theory on the Origin of Species. And the economic development of the country would be spurred by scientific collection and analysis of the natural resources of each region. For a collector such as Baird, each specimen was a piece of a puzzle, which when compared, contrasted, juxtaposed and arranged systematically, contributed to a larger picture of the order underlying nature. In 1868, he published a four volume series that catalogued all known North American bird species. Ten years later, Baird became Secretary of the Smithsonian upon the death of Joseph Henry, the first leader of the emerging national institution. It was Baird, however, who became one of the first naturalists in America to argue for the careful study of the already vanishing natural landscape of the United States. Even in the mid-nineteenth century, he anticipated the potential for human destruction of natural habitats. Then in 1871, Baird’s next major appointment made him commissioner of the newly formed Commission on Fish and Fisheries. This forward-looking branch of the government office that would become the U. S. Fish and Wildlife Service, was established–even at this early date–in order to track and argue for fish species and fish stocks that were already declining in the latter decades of the 19th century. Two years later, Baird published an 850-page Report on the Condition of Sea Fisheries of the South Coast of New England, a work that suggests how diligently he worked at all of his professional activities. He became Secretary of the Smithsonian Institution in 1878, only the second person to lead this national museum and research institution. Baird died in 1887 in Woods Hole, Massachusetts, at the summer fish station that he had had helped to establish there fifteen years earlier. The Baird’s primary mission is to transport fingerling and yearling lake trout raised at Service hatcheries in Wisconsin and Michigan to restore lake trout populations in lakes Huron and Michigan. The Service produces almost 4 million lake trout each year; it transports 95 percent of these fish to important offshore sites for release. Offshore stocking results in better survival; it also increases the probability that lake trout will spawn at offshore habitats near stocking locations. The configuration and support systems of the Baird ensure optimal water and oxygen conditions for lake trout during the ride from shore to stocking sites. Each year, the Baird will travel 2,500 miles in lakes Huron and Michigan during a 60-day period from April to June. So Spencer F. Baird remains a very active presence in the government’s fisheries operation. Baird’s Sparrow: A creature in danger who is hard to keep track of or to save.